’’Prevent abandoned cart, increase conversion rate by 45% and boost traffic at the same time"
Extremely easy to use, no coding skills required, you can create your own in less than 1 minute, even tweet messages for your customers to share! 24/24 Super fast customer support via hotline and email to make sure the app works perfectly on your store! 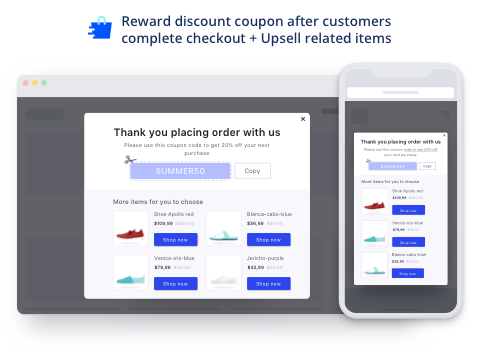 Show an offer popup after customers add items to cart on product pages or review orders on cart page, order them to share their cart on Facebook or Twitter in order to receive a free / discount / discount code. Generate referral traffic from your network sharing created by your customers. No more Facebook ads pain. 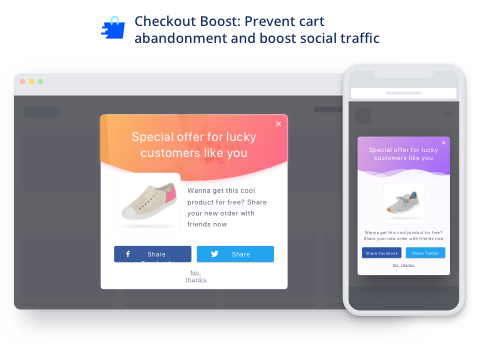 With Checkout Boost, the more offers you to the customers, the more shares you get, and the more social traffic you win. Online shoppers are prompted to make an instant purchase because they are pressed for time. That's why Amazon runs flash sales or time-limited deals and makes a bunch of profit from that. A nice countdown timer will be on the road and will be ticking! e-Commerce industry sees an overall abandonment rate of 68%. Ignore this fact? You're leaving a lot of potential sales on the table. 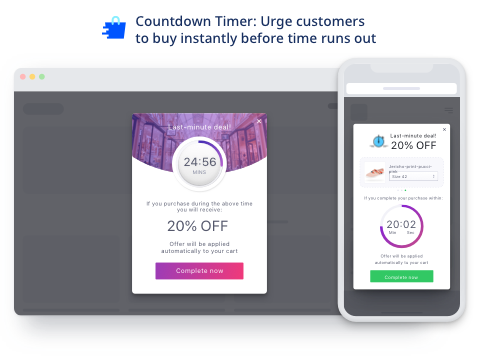 Create Exit Intent with Checkout Boost to detect leaving customers, catch their attention on your sweet offers, and convert them back into sales. 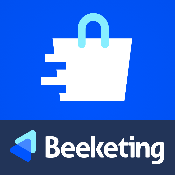 Wanna create a little fun for your customers when they shop with you, while at the same time? Apply gamification rules to your offers with Checkout Boost. This feature allows you to show the price of a goal amount. A heading bar will show up to encourage customers to spend a little more in order to receive a sweet offer. It's a win-win that you will definitely love! If you want to create Buy-1-Get-1 promotions, Checkout Boost app helps you run such BOGO popups you have many products as you want. You can also ask for a quote to social media to receive your BOGO offers. It's 5 times easier to sell than to new customers. How can you do that with Checkout Boost's Post-checkout offers? After customers complete their order to social media, then they might be interested in their social media. Now that they are coming back to you, they will come back to their discount, make more purchase, and become your loyal fan forever!